The Hudson River Estuary Watershed comprises the area from the Federal Dam in Troy to the southern end of Manhattan. Four urban subwatersheds – Sparkill Creek, Saw Mill River, Bronx River, and Pocantico River – are all found in the lower reaches of the watershed nearest to the NY-NJ Harbor Estuary. Historically, the rivers have been heavily urbanized and used for industrial and sewage waste disposal. As communities rediscover their local rivers, recreational opportunities have become more frequent, with more than 3,000 paddlers and rowers annually in the Bronx River, and, in recent history, the annual 8 Bridges Hudson River Swim. Despite water quality improvements over the past five decades, three of the four subwatersheds in the Lower Hudson River Estuary remain on the Clean Water Act 303(d) list as impaired waters due to issues ranging from floatables/debris, heavy metal concentrations, and high levels of pathogens. The fourth tributary – Pocantico River – is listed as “unassessed.” Deteriorating infrastructure, combined sewer overflows (CSOs), and the resulting public health risk created by sewage pollution are a widely recognized issue in the state of New York (NY). To deal with this problem, the state legislature adopted the Clean Water Infrastructure Act of 2017, allocating funds to improve drinking water, update wastewater treatment facilities, and support green infrastructure. Engaging volunteers in community science is a hallmark of the initiative developed by CURB and partners. Beginning in April 2017, community members received training on water quality sampling as well as the science on which the sampling program is based. 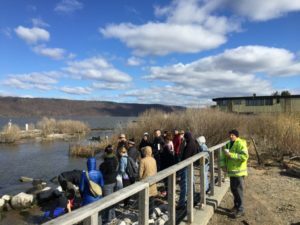 About 40 Citizen Science volunteers participated in the program and sampled at 63 sites within the four Hudson River Estuary subwatersheds during the recreational season of May through October 2017. For more information about the project organization and methods, see the Quality Assurance Project Plan. 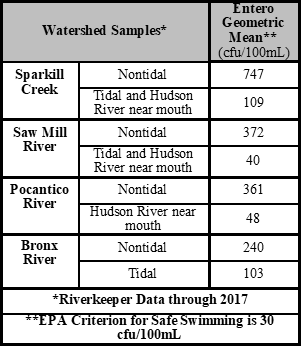 From the 2017 Water Quality Reports, Sparkill Creek, Saw Mill River, Pocantico River, and Bronx River, Entero concentrations far exceeded EPA standards when compared to the 30-day geometric mean. Water quality data from the Hudson River near the mouths of the Sparkill, Saw Mill and Pocantico also indicate that levels of Entero are higher than EPA’s recommendation. Samples at all locations also exceeded EPA’s recommended Beach Action Value criterion for safe swimming with a failure rate between 80-94%. While the data show that levels of Entero increase after rain events, even measurements during dry weather are higher than the EPA recommendations for safe recreation. High levels of pathogens in the four rivers during both dry- and wet-weather conditions help guide both short-term and long-term solutions. Samples taken at locations from the headwaters to the mouth of each river allow project leaders to track sources of pollution and to pinpoint local run-off issues or sewage leaks. As an example, the Bronx River Alliance detected high levels of Entero in the upper reaches of the Bronx River in 2014. Because the river is not connected to the sewage system, the source was unknown until the City of Yonkers identified a clog of the sanitary sewer diverting raw sewage directly into the river from a diner and near-by apartment building. The sewage clog was resolved, and levels returned to baseline until another clog in late 2017 was discovered through monthly monitoring. This is not an isolated circumstance; there are more situations like this in each of the subwatersheds. Therefore, short-term remedies in each urban subwatershed contribute to the health of the Hudson River and the NY-NJ Harbor Estuary as a whole. Dry weather data suggest that there are discreet sources of pollution in each subwatershed, while wet weather data indicate that stormwater leaks and overflows are a problem, supporting the need to repair wastewater infrastructure. 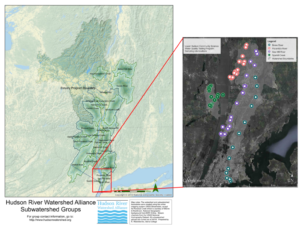 The information garnered from the Lower Hudson Urban Waters Collaborative is reported on the Riverkeeper and Bronx River Alliance water quality program websites and through EPA’s STORET database. 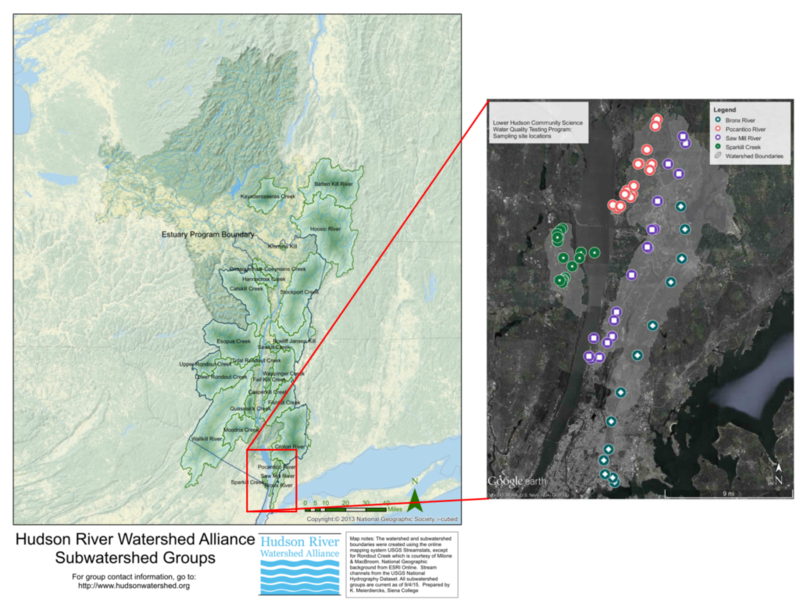 Data from the water quality monitoring program is also used in Riverkeeper 2017 Water Quality Report that includes an inventory of wastewater treatment plants and recommends possible infrastructure improvements within the Hudson River Estuary Watershed. The Lower Hudson Urban Waters Collaborative water quality program creates pathways for turning Citizen Science into coordinated action. In March 2018, CURB organized the Lower Hudson Urban Waters Summit, where they shared results of the Lower Hudson Urban Waters Collaborative. Over 100 students, residents, scientists, educators, watershed groups and government officials attended the summit to discuss solutions to flooding, urban runoff pollution, deteriorating wastewater infrastructure, and combined sewage overflows. The water quality data can be used not only to inform the public, but also as a model to other organizations engaged in tracking sources of bacteria in their watersheds. In addition, the information is an important tool to help local leaders in their watershed planning and decision-making processes. While CURB and partners were each already working on water quality monitoring and Citizen Science, the EPA Small Grant project solidified partnerships between the organizations. A side benefit to the project was building on past water quality data and volunteers of Groundwork Hudson Valley’s focus on the Saw Mill River—adding more partners and citizens to the fold. The Lower Hudson Urban Waters Collaborative plans to continue the work to improve water quality and magnify their impact in the Hudson River Valley. As a part of the nation’s largest and one of the oldest urban centers, the river systems in NYC and surrounding areas are rich with history and environmental progress. During the 1700 and 1800s, the lower portion of the Hudson River Estuary Watershed was heavily urbanized and industrialized, with much of the river systems being used for flood control, transportation, sewage, and industrial waste disposal. Since 1880, there has been a shift toward preservation of resources in the lower Hudson River Valley. In the 1960s, local activists fought to protect the Hudson Highlands from energy development resulting in the first US court case deciding that environmental impacts had to be considered in development projects. This drive toward action continues today in the Hudson River Estuary as well as the NY/NJ Harbor. For more UWLN stories about EPA Urban Waters supported projects in the area, see: Reclaiming Urban Waters: Daylighting of the Saw Mill River, Combining Service Learning and Recreation for Stewardship, and Raising Awareness: Microplastic Pollution in the NY-NJ Harbor Estuary. For more resources from the Lower Hudson Urban Waters Collaborative, see Community Resources for Improving Water Quality. The mission of Center for the Urban River at Beczak (CURB) is to advance environmental knowledge and stewardship by providing high quality K-12 environmental education for the local community, establishing a regional hub for research and monitoring focused on Hudson River estuary and urban watershed issues, and serving as a welcoming open community space for a variety of civic and cultural activities.